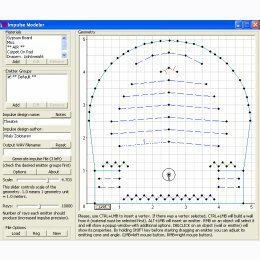 This tool will help you to design your own room impulse responses ranging from small rooms to large echo halls to small "intimate" cabinets to echoing soundscapes. You have the opportunity to design materials and room's geometry. There is a bunch of other settings too. These are room's size which really alters perceived size, density control which allows to create maximally dense reverbs, "random seed" parameter which allows to create endless number of variations of the same room design. You can also set output sample rate and bit depth. After you have designed your room you just need to press "Generate" button and after a while a freshy WAV file will be ready to be loaded into any convolution reverberator for your listening pleasure.